This article explains how to bulk-export Pic Scanner Gold gallery photos to Google Photos. The grey screen lists the most-used services. To access all other weird and wonderful destinations, tap Show all. This displays an expanded list. Select any, and you’re done. Google Photos offers unlimited “free” storage for high quality digital photos. 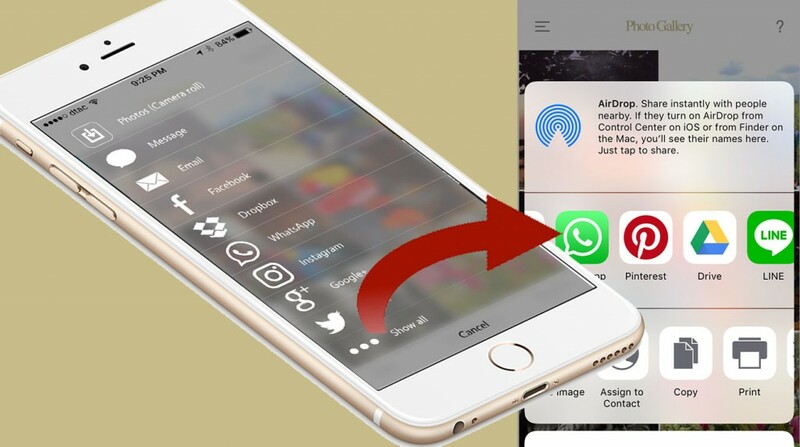 Install their app on your iPhone or iPad, and set it to auto upload all pictures from Photos app to Google Photos. However, exporting selected photos to Google Photos isn’t so easy. Let’s say you want to export specific pictures from Camera Roll to Google Photos. You open Photos app, select photos, and tap the export button. You’ll see all the export options (including Google Drive, if you have it), but no Google Photos! You can’t manually upload pictures from iPhone or iPad. You must first transfer them to your computer, then drag them into Google Photos. 1) Install Google Photos and Google Drive apps your iOS device, and log into both apps. 2) In Google Photos app, tap Menu ( ) > Settings ( ) > Turn Back up & sync “ON” > If asked to let Google Photos access Photos, go to Settings app > tap Privacy > Photos, and turn Google Photos “ON”. 3) In Pic Scanner Gold, go to Gallery or album > Select (max 10 photos) > Export > choose whether to Include or Exclude Captions > Photos (Camera Roll). The photos will be saved to Photos app, and will also sync to Google Photos. Give it a try, and let us know if you have any problems uploading from Pic Scanner Gold photos to Google Photos or any other photo storage service you want to use.